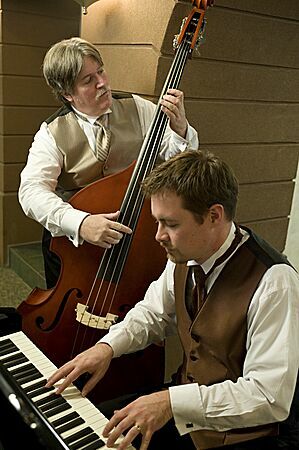 City Lights is a duo of piano and string bass ready to provide the musical live background music for your next special event. Offering a wide selection of popular standards, showtunes, cocktail jazz, swing, blues & ragtime, City Lights is the perfect choice for creating a relaxed atmosphere in a quiet setting for the ages. Pianist Chris Lamb is a classically-trained performer and audiences and clients are thrilled with the versatility of his style. Bassist Nigel McEathron is the musical bottom end, captivating audiences with his professional style. Together they are City Lights, the final touch for your next special event.